The Swiss manufacturer and developer of ball bearing solutions is announcing the standardization of a range of exclusively Swiss Made bearings, with a proven track record of over 10 years in stretching plastic films. 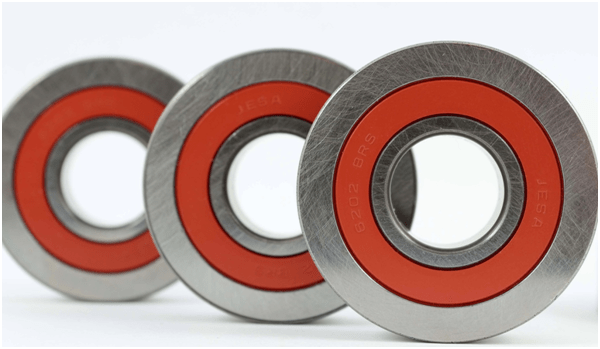 JESA bearing solutions, a developer and manufacturer of solutions based on ball or needle bearings for over 40 years, is standardizing a series of specific chain rollers for plastic film stretching machines. More than ten years have passed since the Fribourg company started the production of the “LR 202” roller type for major plastic film producers in Germany. A specific range has been created to meet demand appropriately. Following a controlled cooling process, the film goes through a first stretching machine that draws it out length-wise. It is stretched as it passes through the machine with the help of drive rollers which are rotating at different speeds. In the next step, the film is stretched width-wise by means of a second machine. The film is pinched on each side by carriages on bearings; it is heated and then stretched. Forces and transverse loads can reach up to 3,500 N per carriage. The materials and ball bearings have to withstand temperatures from 100 to 250°C and production speeds between 100 and 500m/min according to the required film thickness. JESA is offering several sizes and types of sealing in order to match most models of plastic film stretching machines. The basic type, “LR202 2BRS” (D40mm d15mm and L11mm) has a dynamic load carrying capacity (CwT) of 5,800N and also comes in two other sizes with outer diameters of 34 and 42 mm. A type with two rows of balls “LRD 17/40-18 KLL” is also available for the most demanding applications. Two sealing solutions are planned: a Viton labyrinth seal for single row ball bearings and a steel labyrinth lid for double row ball bearings. Obviously, other options and dimensions can be made to measure if the application is different from the current specifications used by JESA. Developed and produced in Switzerland and approved by German industry for over a decade, these rollers are made from a metal alloy which is heat treated for high temperatures (250°C) and 100% controlled in Switzerland. Regarding the efficiency of the system, JESA has made every effort to make this product energy efficient: superfinished raceways and Viton friction seals provide optimized efficiency and improved accuracy in operation. As for lubricating, lifelong lubrication specially designed for high temperatures takes place on both sides of the roller system to ensure the lubricant is distributed more efficiently during operation. At JESA, each application is processed and analysed individually by specialist engineers. JESA is aware that the details are an integral part of the product and contribute to its success and long lifecycle. The above technologies such as special steels, low friction or other seals can be combined at will to meet the needs of customers.